Reservists give up their spare time to serve in the Reserve Forces, balancing their civilian life with a military career. They often work in specialist areas such as medical and cyber and are currently supporting operations worldwide. Reserves day is an opportunity to recognise their contribution. 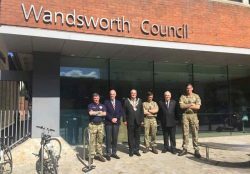 Local reservists were invited to the town hall by the Mayor of Wandsworth Cllr Richard Field and Paul McCue – who is managing director of the council’s leisure contractor Enable, a published military historian and one of the council’s two Armed Forces Champions. The other is Councillor Leslie McDonnell. Wandsworth is home to Army Reserve soldiers from the London Regiment based in Clapham Junction and Balham, and the Royal Marine (City of London) Reserves based in Southfields. The borough also hosts army, sea, marines and air cadet units. Wandsworth has signed the Armed Forces Community covenant pledging its support to the forces, and members of the armed forces can qualify for a number of benefits in the borough. Some may be eligible for housing priority, and the council’s leisure centres contractor, Places for People, offers special rates. 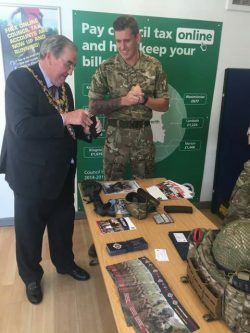 Read more about the support Wandsworth gives to the armed forces.